Tag Archives for " case study "
5	Are Your Case Studies Actually Turning Away Prospects? I’m a big fan of case studies as an important part of the content journey. The reason a well-crafted case study can be so effective is that if you strip away all the marketing talk and focus on telling the story of a real business getting real results you’ve got the makings of a pretty potent marketing asset. People love to see people in their same situation getting a result they too would love to get by way of working with you. The key to writing an effective case study lies in throwing out the template used by 99% of marketers. You’ve seen it a million times – Client situation, client challenge, our solution, their results, more about us. Now, sometimes this format serves well, but here’s where it might turn away people you were meant to serve. The traditional format assumes that the reader has the same problem or challenge or at least framed it that way, and it assumes they are ready to accept the same solution. The truth is that they probably don’t know what their real challenge is and by sharing your solution they can either get someone else to do it or dismiss it without enough information to make an intelligent decision. And that’s how your case studies are costing you big. 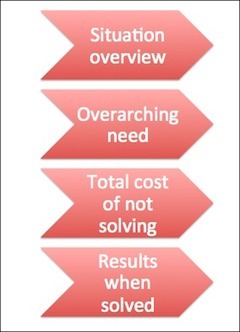 A more useful approach is to spell out how much not solving their problem could eventually cost. This, by the way, is the most efficient way to sell in person as well. You have to get your prospect invested in finding some solution at any cost because not doing so could lead to eventual doom. I’m not trying to suggest too much drama here, but when I sell marketing consulting services people often start by suggesting they need more leads. Simple enough until you can get them to further investigate what would happen if they didn’t. Maybe they lose their job or their house. Or maybe they just miss out on other parts of their life. This isn’t an appeal to sell fear; it’s an appeal to dig deep enough so that your prospects know how much they have to gain by solving all of their problems. When you help people better understand the gravity of their challenges, you can more easily get them to invest in a world where all of their problems go away. You can help them see any solution you recommend as an investment rather than a cost and when you sell services, in particular, this is a must. So now your case study format may look more like this: Situation, overarching challenge, the cost of not finding a solution, results gained by the solution we implemented. In this format you’ve juxtaposed pain and gain and did you notice – nowhere did you reveal how you got the result – that’s the discussion for your proposal! The other thing that this format does is that it creates a great desire to solve problems while giving you tremendous leeway to address just how you can solve the problems. Instead of telling your prospect what their problem is and how to solve you get them involved in defining and communicating the story of their problem, so you let them feel like the solution is of their own design. Recently, I interviewed Ian Altman, author of Same Side Selling, a book that also recommends this very practical approach for both case studies and selling in general.